August | 2014 | ride.hike.eat. We just came back from the most fantastic trip. 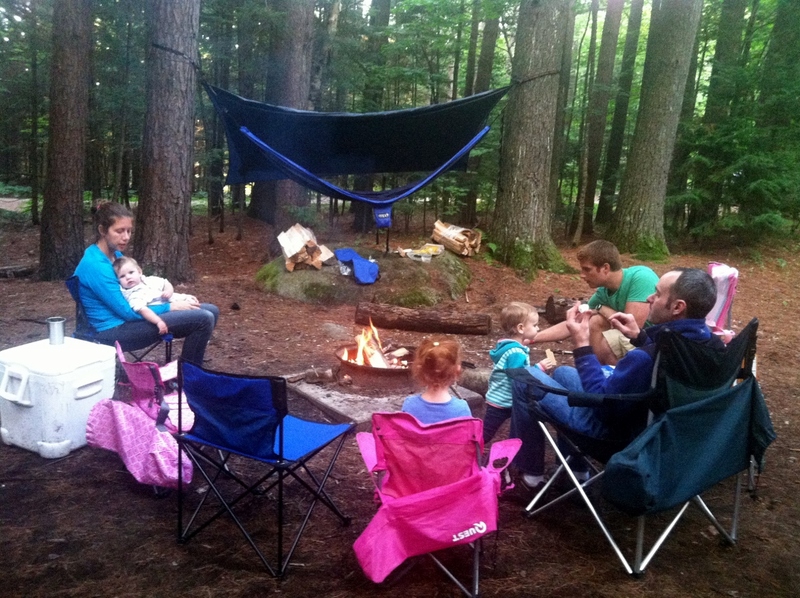 We spent 4 nights camping at the Adirondack Loj in Lake Placid with our friends Amy and Richard and their 2 daughters Chloe and Aubrey. Lake Placid is a heavenly place. The air is clean and the views are just amazing. I just love being there. At the summit of Mt Jo. We have not made it to Lake Placid in about 5 years or something like that. Cycling, pregnancy, and Julia’s arrival were the culprits. :) Since Julia is a bit older now and after camping in Watkins Glen, we decided to give it a try. I must admit that I was a bit nervous. I cannot remember the last time we camped for 4 nights, if ever. I guess there is always a first… ha! The drive was fine, but as soon as we arrived in Lake Placid, it started to pour… a torrential downpour with hale. Yikes!! I knew that rain was in the forecast, but no one mentioned hale. Luckily we planned to have lunch first, so we did not have to setup camp quite yet. 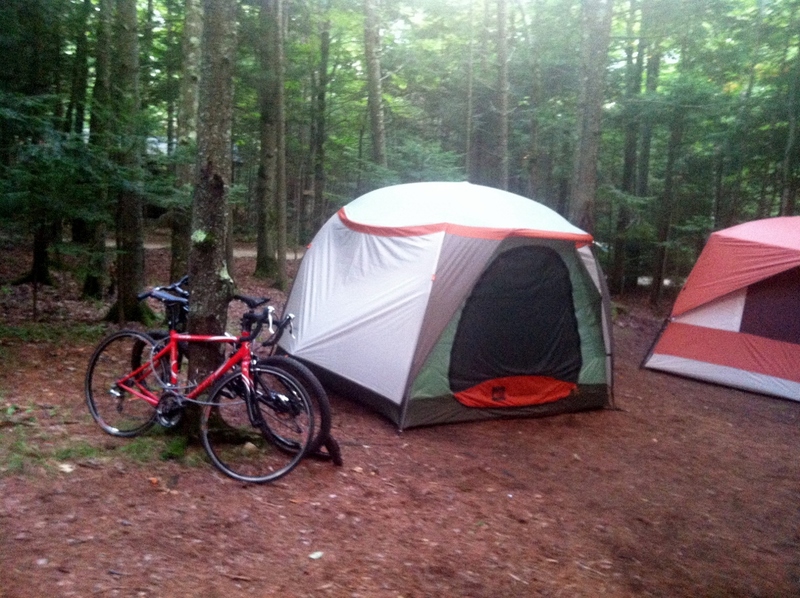 The rain did stop, so we ended up setting camp in semi dry conditions. The rest of our stay was beautiful! Sunny and warm. So lucky! We had lots of activities planned, thanks to Richard. He is so good at planning! 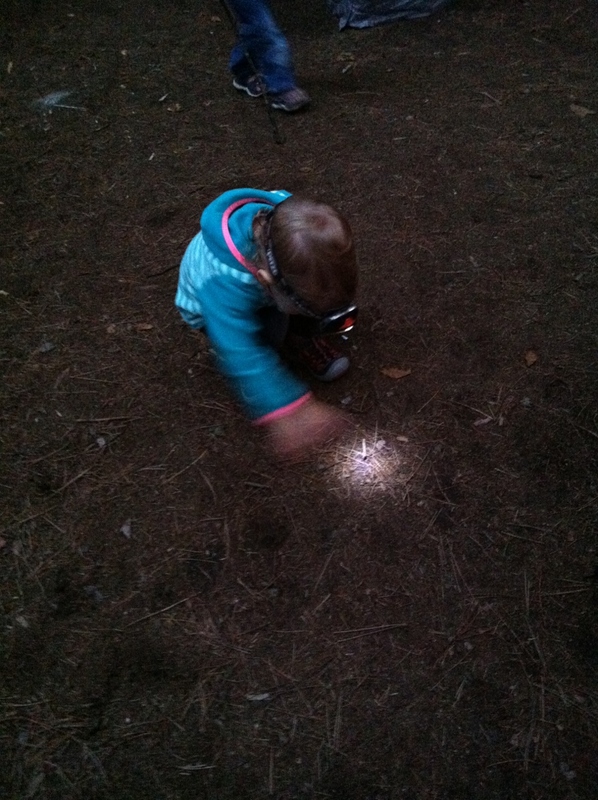 :) He found a bunch of things for us to do, including hikes that were toddler friendly. Owl’s Head was the first mountain that we climbed. 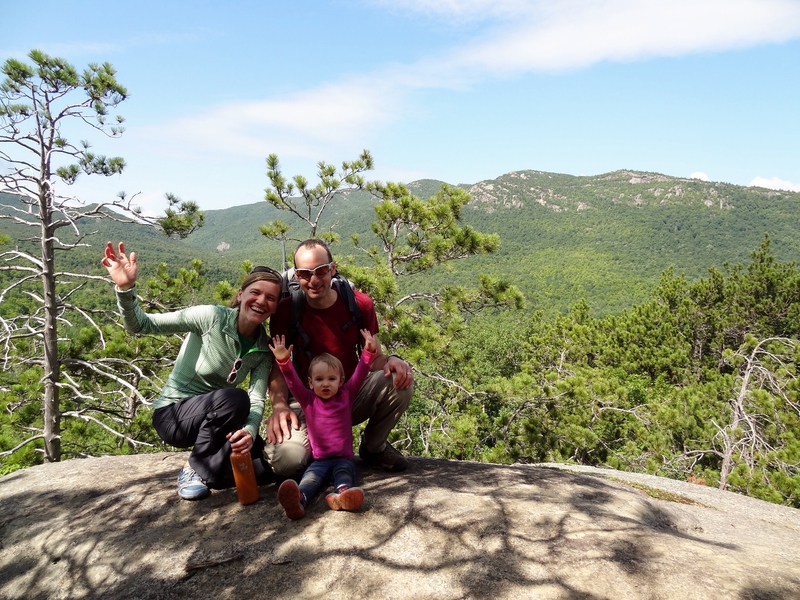 It was a typical Adirondack mountain… normal trail leads to scrambling up rocks and boulders as you reach the summit. 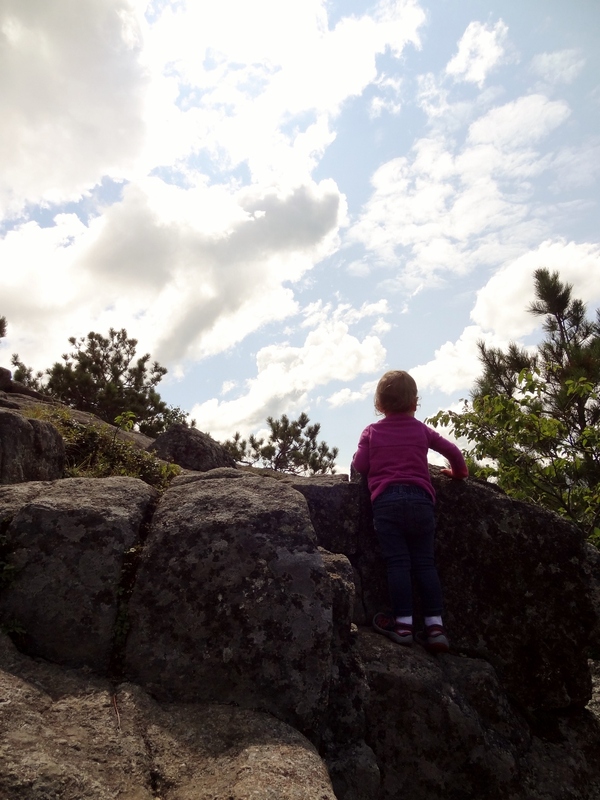 As soon as we started our hike, Julia insisted on hiking on her own. Once we let her loose, she was having a blast! 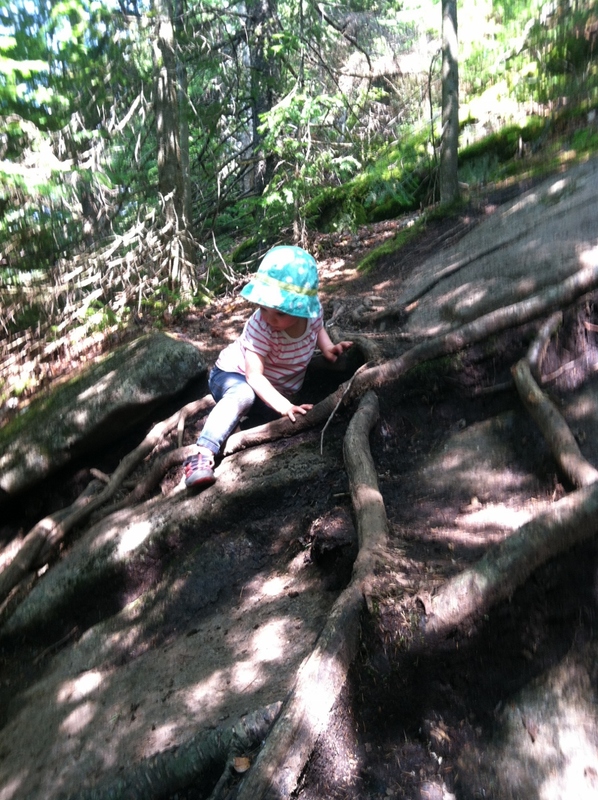 She loved climbing up the rocks and boulders. So fun! 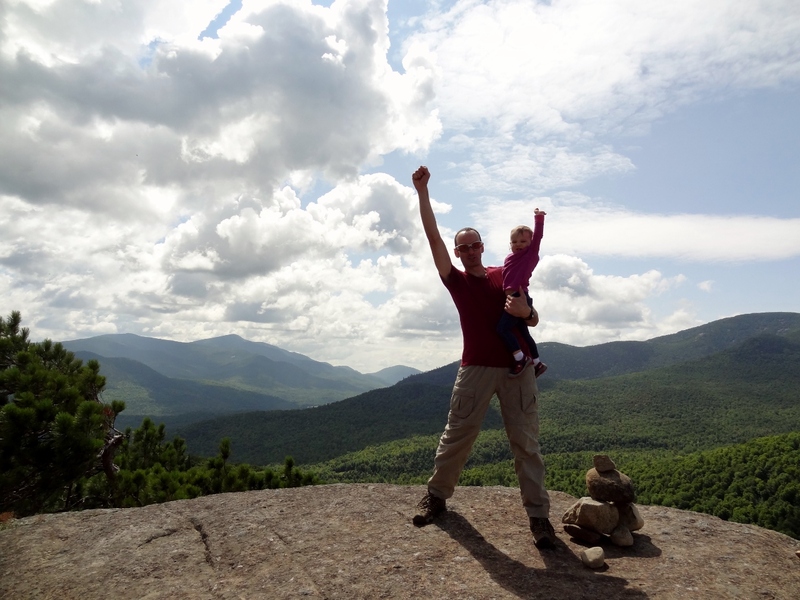 Julia’s first hike in the Adirondacks… Owl’s Head. Our second hike was Mt Jo. 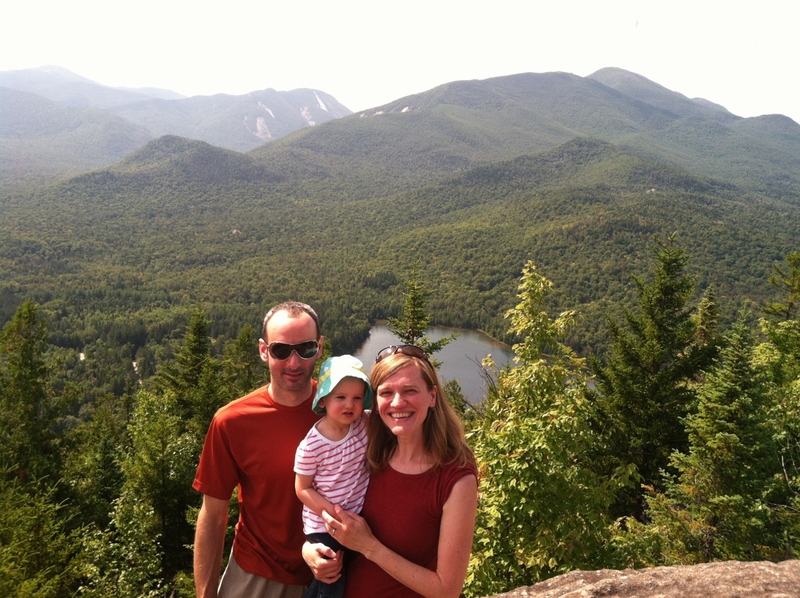 This too was a typical Adirondack mountain. We decided to hike it as part of a guided tour. Our leader Laurel told us about the vegetation and history of the mountain. It was fun to lean more about the area. Once again Julia insisted on hiking on her own, but since we were hiking with a guide, we kept telling her that she had to wait. 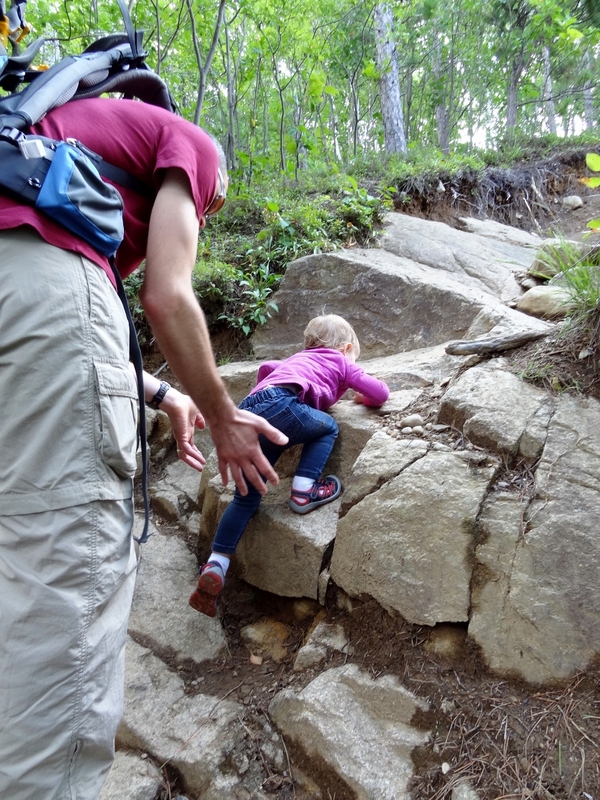 She ended up hiking on her own during the descent. It was definitely more challenging descending, but she did so great! 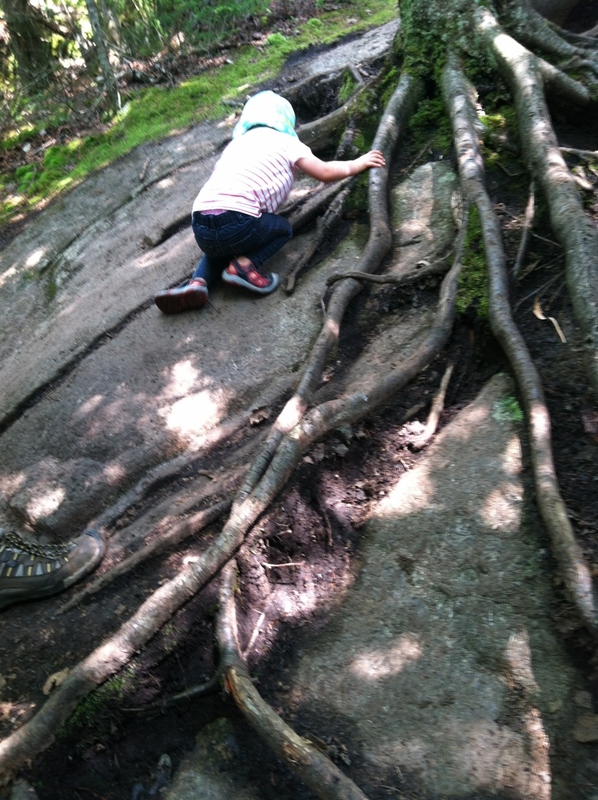 She loved using the roots as holds. I am so proud of her! 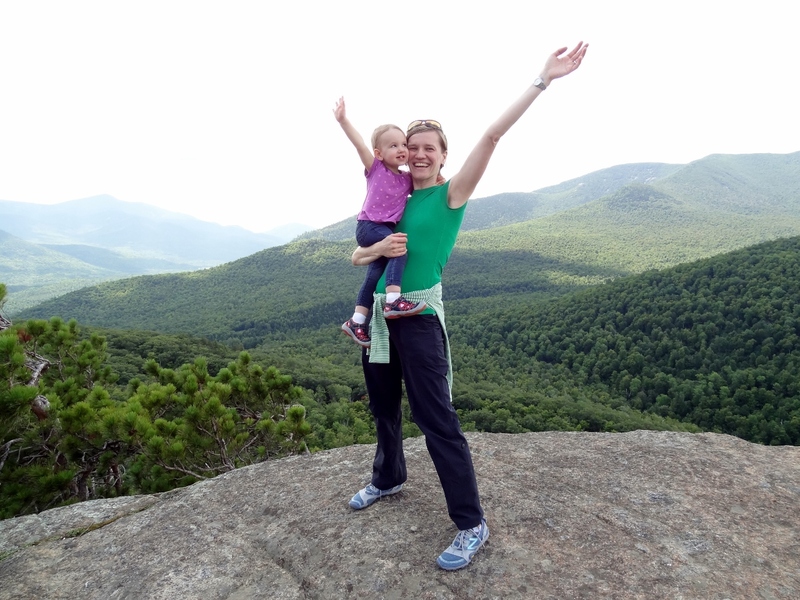 I never in a million years would have thought that my 2 year old could hike, especially not a mountain in the Adirondacks. So great!! Our planned activities also included a bike ride for the boys and another for the girls. Joel and Richard went for a mountain bike ride on the Lussi and Loggers trail. Apparently it was a good ride. 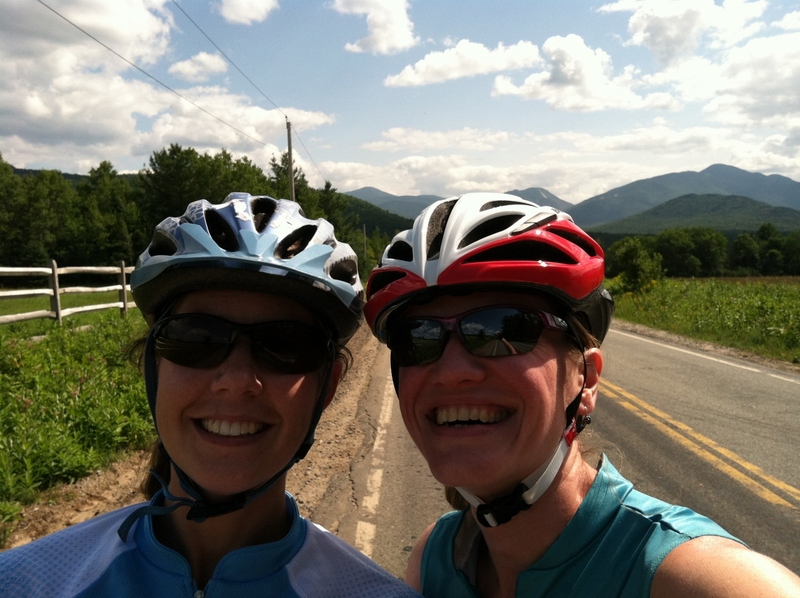 Amy and I rode on the Adirondack Loj Road. It included a few awesome descents. Amy turned around once we reached Route 73 and I continued on to Bear Cub Road. The road was super nice… very quiet and scenic. I passed the Cornell maple and potato seed farms, a few farming fields, as well as 2 guys on a horse and buggy that was pulling a huge tire. They stopped to let me pass and I learned that they were using the huge tire to move rocks. Ha! Riding on the road also gave me a different perspective of Algonquin Mountain… I have only seen the mountain from 2 directions, so this was kind of fun. 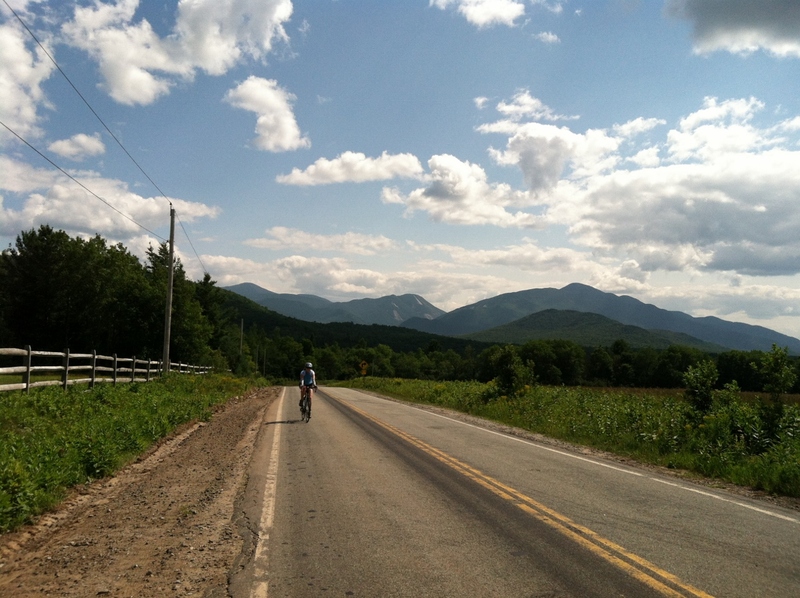 Amy riding on one of the ascents on Adirondack Loj Road going toward Route 73. The road had some amazing view of the surrounding mountains. 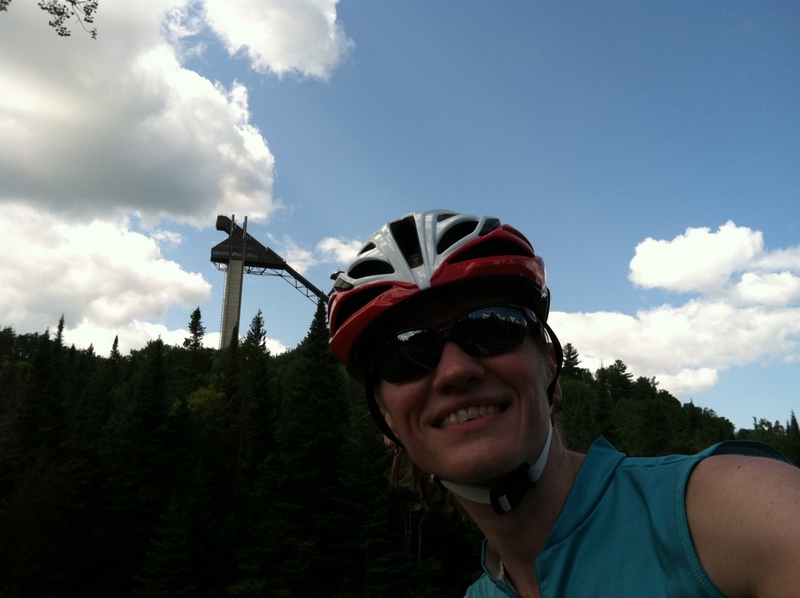 My return on Adirondack Loj Road was a different story… those amazing descents turned into painful ascents. The worst of it was at the last stretch before reaching the campground. Oy! I was really hoping to do another ride, but time did not allow. I really wanted to ride on River Road. Joel and I took a drive on it instead and it was so beautiful… lots of twists and turns and amazing views of Whiteface Mountain. Next time. 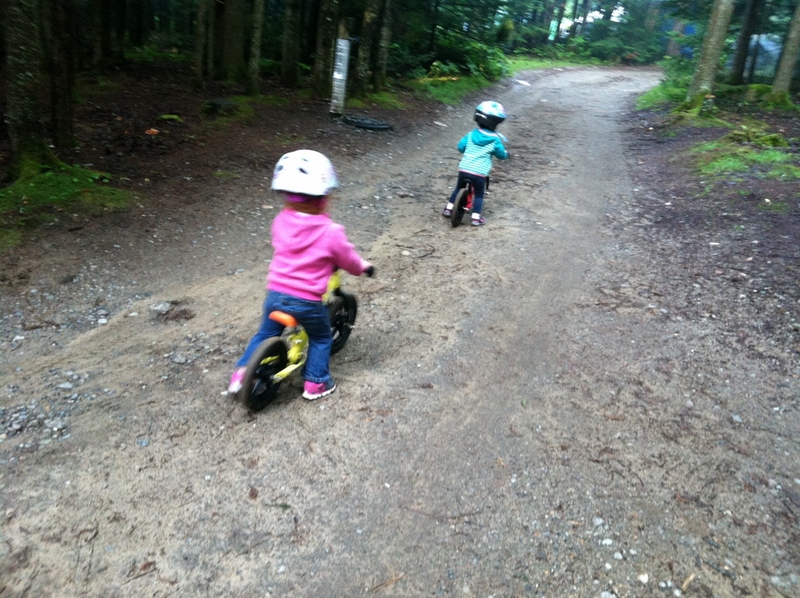 Julia and Chloe rode their bikes a bunch too. 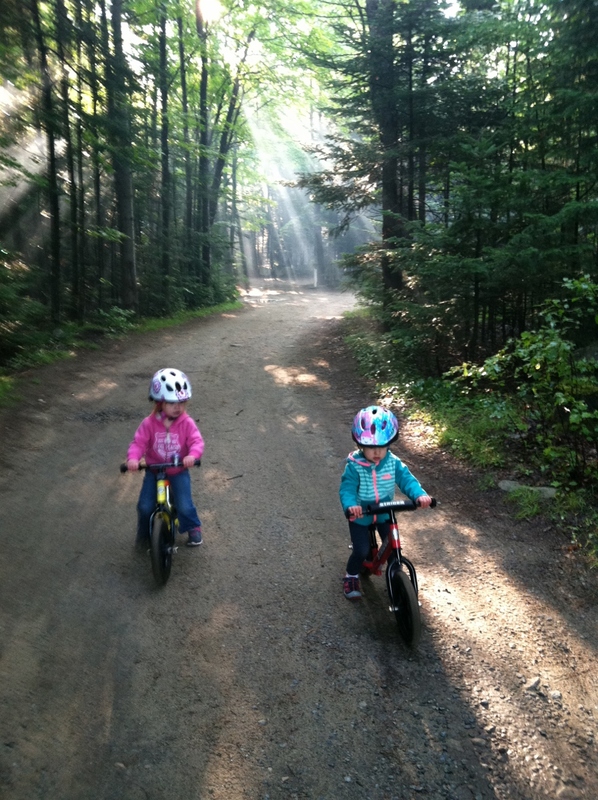 As soon as Julia woke up everyday, her first words were “I want to go outside and ride my bike!”. They rode around the campground’s road and also around our campsite. It was so fun to see the two of them ride. Amy and I kept saying that we were so glad that we had their bikes, since they had something to do. I love watching them ride. So cute! Riding around the campground’s road. I love the sun rays in the background! 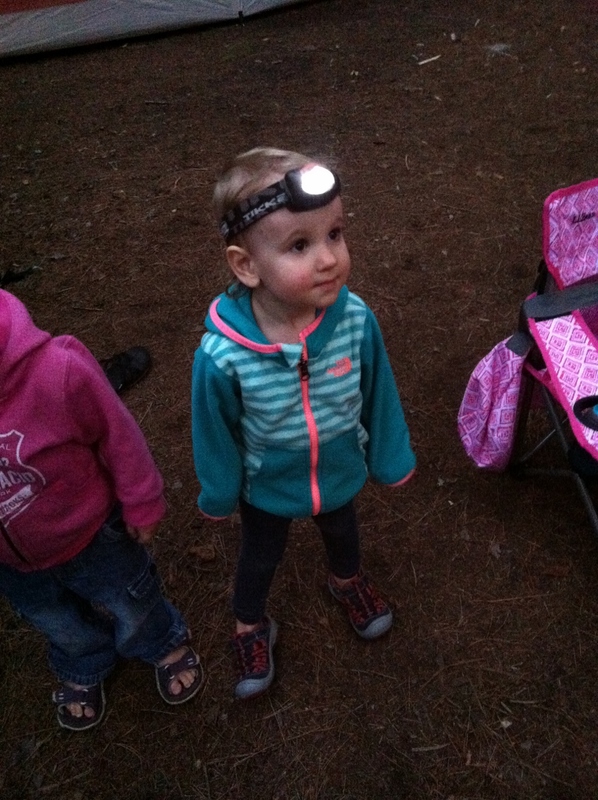 Julia’s first time wearing a head lamp. It was such a fun trip! Julia did so well at camp. She slept super well every night, despite the cold nights, and loved being outdoors. I look forward to our next trip.